STUDENT LIFE << 21 and its program provides an opportunity to meet and become acquainted with the foreign students on campus. The Association's motto is "Above All Nations, Mankind," and friendship among students of all nationalities is its purpose. 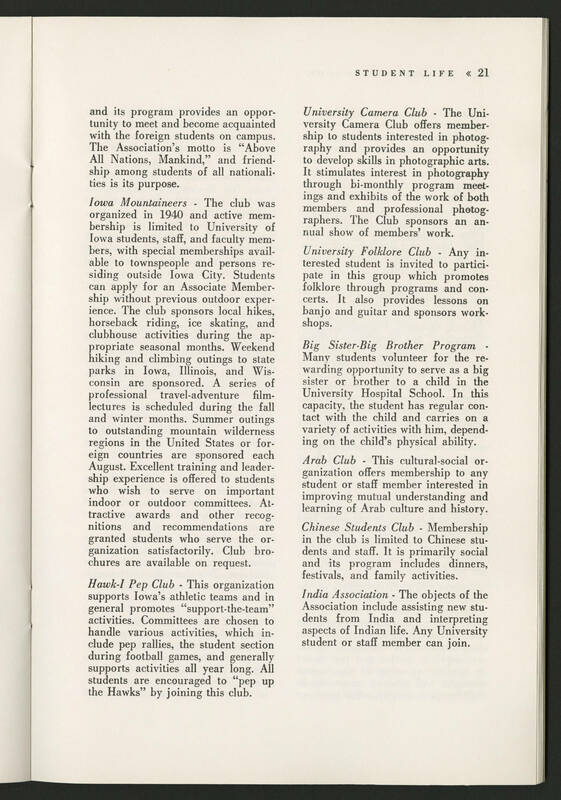 Iowa Mountaineers - The club was organized in 1940 and active membership is limited to University of Iowa students, staff, and faculty members, with special memberships available to townspeople and persons residing outside Iowa City. Students can apply for an Associate Membership without previous outdoor experience. The club sponsors local hikes, horseback riding, ice skating, and clubhouse activities during the appropriate seasonal months. Weekend hiking and climbing outings to state parks in Iowa, Illinois, and Wisconsin are sponsored. A series of professional travel-adventure film-lectures is scheduled during the fall and winter months. Summer outings to outstanding mountain wilderness regions in the United States or foreign countries are sponsored each August. Excellent training and leadership experience is offered to students who wish to serve on important indoor or outdoor committees. Attractive awards and other recognitions and recommendations are granted students who serve the organization satisfactorily. Club brochures are available upon request. Hawk-I Pep Club - This organization supports Iowa's athletic teams and in general promotes "support-the-team" activities. Committees are chosen to handle various activities, which include pep rallies, the student section during football games, and generally supports activities all year long. All students are encouraged to "pep up the Hawks" by joining this club. University Camera Club - The University Camera Club offers membership to students interested in photography and provides an opportunity to develop skills in photographic arts. It stimulates interest in photography through bi-monthly program meetings and exhibits of the work of both members and professional photographers. The Club sponsors an annual show of members' work. University Folklore Club - Any interested student is invited to participate in this group which promotes folklore through programs and concerts. It also provides lessons on banjo and guitar and sponsors workshops. Big Sister-Big Brother Program - Many students volunteer for the rewarding opportunity to serve as a big sister or brother to a child in the University Hospital School. In this capacity, the student has regular contact with the child and carries on a variety of activities with him, depending on the child's physical ability. Arab Club - This cultural-social organization offers membership to any student or staff member interested in improving mutual understanding and learning of Arab culture and history. Chinese Students Club - Membership in the club is limited to Chinese students and staff. It is primarily social and its program includes dinners, festivals, and family activities. India Association - The objects of the Association include assisting new students from India and interpreting aspects of Indian life. Any University student or staff member can join.